With its clear writing and engaging design, Panorama allows for a thorough understanding of the complex subject of classical mythology. And its interdisciplinary approach encourages readers to explore the incredible connections mythology shares with literature, vocabulary, history, science, and the arts. Teachers of English, classical languages, and ancient history can draw repeatedly from a classroom set of books to enrich their curricula. Art teachers, librarians, and homeschoolers will find Panorama an indispensable resource for learning and research. And because Panorama is not a typical textbook, it remains both instructional and enjoyable for the general interest reader. "Do we want to turn our schools around? Put Greek and Roman myths and epics in every child's intellectual backpack. They lay the foundation for world literature and encourage students to grapple with the big ideas that underlie all cultures. 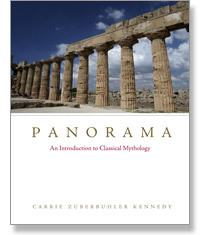 I hope Carrie Kennedy's wonderful book, Panorama, is widely used to teach, explain, and delight. It gives the ancients a place in history, includes useful details on word derivations, and retells the stories to make them more easily understood. It's a teacher's and learner's treasure." "I enjoyed this book tremendously. The concept of organizing myths by theme is inspired and is a great strategy for dealing with a lot of material in a thought-provoking way. The teacher's guide will be of considerable help to English, Latin, or history teachers, providing a wonderful variety of ways to make classical mythology relevant to today's students. Kudos to Ms. Kennedy for her creativity."